Commercial properties and local businesses alike have entrusted our high pressure cleaning services to tackle their property cleaning needs. We take on the challenge and are able to complete it with our skill, techniques, and high-grade equipment. Not only do we work with public commercial properties, but we also cater to private property as well. If your private property has been vandalized or simply needs a high pressure deep cleaning service, we’re able to help deliver. Private property owners will often contact us for high pressure cleaning services to help maintain their property at their preferred standards. Although we have our own set of cleaning standards that we seek to achieve when we complete any cleaning project, private property owners often have their own vision of what they’d like to be accomplished when cleaning, or may advise on certain areas to pay more attention over others. 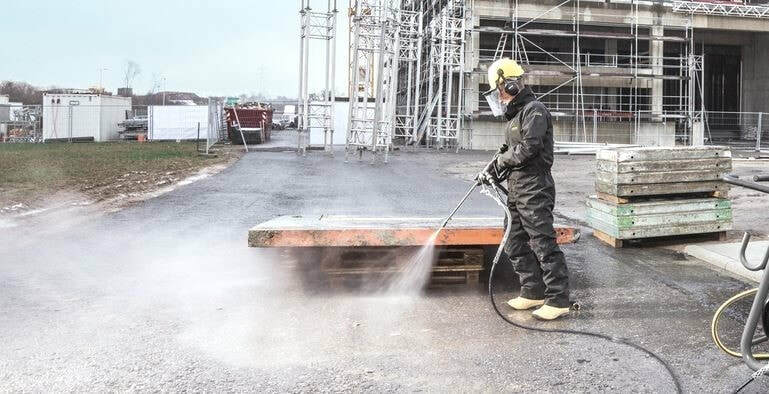 We tailor our high pressure cleaning services to whatever needs our customers’ request and ensure that private properties are cleaned with the appropriate standard that is expected. Parking lot cleaning can easily be achieved for small or larger lots, for open car parks or even parking garages. Our approach to cleaning parking lots is simple – we clear them of concrete debris quickly and efficiently, so they’re up and running again for immediate use. Our parking lot cleaning methods do not damage or interfere with any existing paintings that demark parking spots or driving directions. While these paintings may fade over time due to pressure cleaning, sun exposure, and excessive use, pressure cleaning alone will not cause them to fade immediately, so you don’t have to worry about repainting your parking lot every time you have it pressure cleaned. Graffiti removal is possible with our high pressure washing techniques. In order to remove it beforehand, it must first be observed and determined what type of material it was drawn on. For surfaces like sheet metal, it can be scrubbed and then pressure washed for maximum outcome. Other surfaces, such as concrete or brick, it will require more pressure cleaning techniques that our cleaners are prepared to offer. We approach graffiti removal with an eye for detail to ensure that every pore in the surface material is cleared of graffiti paint, without causing further damage to the existing structure. We want your surfaces to remain clean and graffiti-free and we use a thorough hand to ensure that they continue to look cleaner than before. Buildings and structures can consist of commercial properties such as office buildings, shopping malls, and or apartment complexes. Our team of trained cleaners has the tools and equipment to tackle most of these structures with ease. We are happy to assess any job and give you a quotation for commercial pressure cleaning.